I'm calling this "Day Two", but I'm actually writing this over a month after our return from Turkey. As I write, Tahrir Square, back in Cairo, is again filled with protestors. Their new president, Muhammed Mursi, has claimed absolute power for himself, bringing his country into another uproar. My heart goes out to the Egyptians, whose situation is so dramatic and so desperate. I have begun to connect to them. But now I need to write about Turkey. In a way it's a shame that I keep comparing Turkey to Egypt, but the fact is, I do. Both are ancient civilizations that over time have become Muslim. Both Cairo and Istanbul have mushroomed into megacities of over 17 million inhabitants. I told Peter on one of our last trips, I need to feel a connection to a place in order to relate to it. I think we always need to find and build more connections in all aspects of life. What were my connections to Turkey before traveling there? Not many, unfortunately. Only that I read about Constantinople in history class in school and college, and that I see Turks daily in Cologne. Sometimes I go shopping in a Turkish super market. Once in a while I even exchange a few words in a shop, or now and then a Turkish person wanders into one of my English courses. But I have very little connection to Turkey, certainly nothing emotional. I did have more of a connection, once - Keklik. I met her through my church. She was an atheist, originally a Muslim, who wanted to know what we Christians believed in. I really liked Keklik. She had been a Communist once, way back, while living in Turkey, but it was illegal to be a Communist. She got arrested, sent to prison, and somehow escaped one day when allowed out on a day pass. By the time she settled down in Cologne she was thoroughly disillusioned with the Communists, as she was with the Muslims, whom she called a purely political movement. By now, she didn't fit in anywhere, but she could never go back to Turkey, she said, or she'd be arrested again. We lost touch with one another somehow. She just disappeared out of her apartment, out of the phone book, out of my life. Did she get back to Turkey after all? I wish I knew. I've heard Turkey has made enormous strides in becoming a modern, western country. Germans are starting to acknowledge their Turkish immigrants as part of their culture. There's a popular German crime show that takes place in Istanbul. As I write, I want to explore and to deepen the tentative connections that I do have, and then somehow convey this to you. So here we are, as I segue into "Day Two". Our first morning in Istanbul. The sky is a pale, washed, gauzy baby blue. We board a bus and leave Taksim Square, heading for the sparkling waters of the Golden Horn. We cross one of the bridges, the Ataturk Bridge. Off to our left is the Galata Bridge. I can already recognize this bridge by looking behind me to see the Galata Tower. Before today, I only knew about the Golden Horn from a novel I used in one of the English classes I teach. It's so nice to be able to see it now. We travel along the Horn a while, heading for the Bosphorus, then turn right, once the two bodies of water meet. 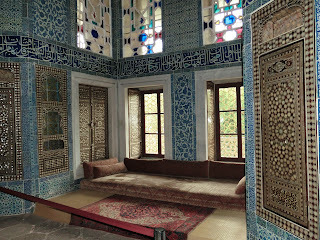 We're going to the Topkapi Palace, something we also read about in my little novel for English class. 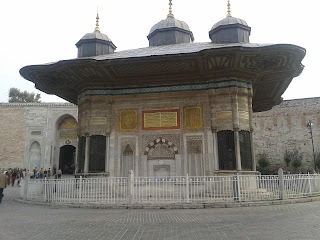 Harun tells us that we will be spending a lot of time in the area around the Topkapi Palace in the next few days. I'm surprised to learn that the famous church/mosque I've heard about, the Hagia Sophia, is on the same grounds as the palace. There's another church that seems to be closed most of the time except for occasional concerts - the Hagia Irene Church. I wish we could go inside that. It's supposed to be beautiful, and to have amazing acoustics. It's supposed to be the oldest church in Istanbul. But we can't go there this time - there are no concerts happening there this week. We walk through a long, tree-lined path, passing the Hagia Sophia, the Hagia Irene, and an archeological museum before we finally get to the Topkapi Palace. 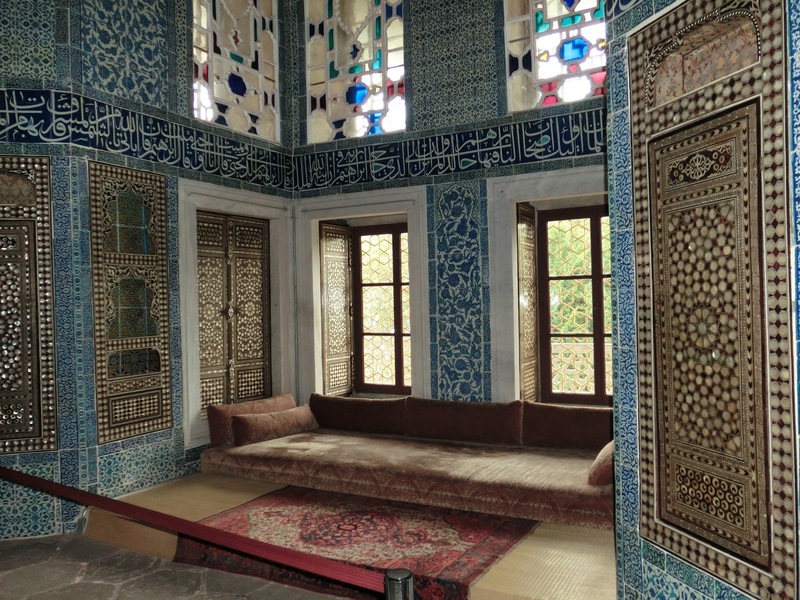 Topkapi Palace, Harun tells us, was built shortly after the Ottomans conquered the city on May 29, 1453, transforming what was once a predominantly Greek Orthodox city called "Constantinople" into a Muslim city whose name gradually changed to "Istanbul". 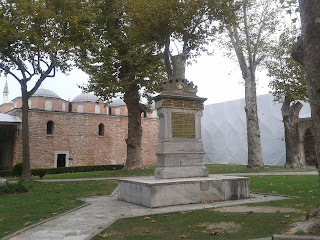 Mehmed II (Mehmed the Conqueror) first conquered the city in a dramatic battle by tricking the Byzantines. The Byzantines had a high city wall that had protected them for centuries. The water inlets to Constantinople were also all protected - there was a chain stretching across the Golden Horn, and boats protecting the shores. But Mehmed thought of something ingenious - he and his soldiers travelled up and down all the seven hills on one side of the Golden Horn, seeking entrance through the back side of the city. They found one gate to the city wall unlocked. Two by two, the soldiers passed through, and conquered the city from within. Once Mehmed had the city in his control, he wanted a palace he could call his own. The palace of the Byzantine rulers was not for him - so he began construction of the Topkapi Palace in 1459, six years after his conquest, and finished building it in 1465. 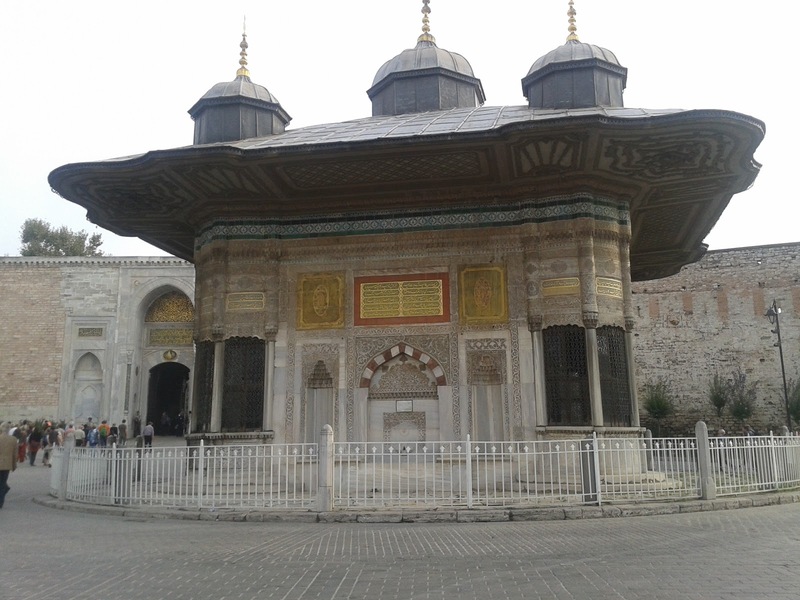 The Topkapi Palace is actually composed of several parts, each part surrounded by a courtyard. It does seem to bear some resemblance in feeling to the Egyptian temples, in that each courtyard one enters is more private and exclusive than the last. By the time you reach the last, the fourth courtyard, you are in the harem, the private living quarters of the sultan and his enormous family, sometimes up to 4,000 people, including all the civil servants. It turns out that Mehmed was only able to live there for one year, and reigned only twelve years before he was poisoned, probably on orders of his son. He and another brother were in turn later murdered. There was so much murder in the harem, fratricide was even a legal means for a while of establishing succession to the throne. We learn that Mehmed's last wife was also strangled in the harem in order to make way for another relative. The harem was not a safe place, despite all the pools, inlaid wood, stained glass, gorgeous tiles and tranquil carpeted pavilions. We see splendid jeweled sabers, daggers and swords. We hear the story of the "spoonmaker's diamond". A homeless person found a huge rock and sold it to a spoon maker. He got three spoons for it. The spoon maker sold the stone to a Jewish jeweler, who took to polishing it. It turned out to be an 86 carat diamond. It is the fourth largest known diamond in the world. I learn about a film that takes place in the palace - "Topkapi", with Peter Ustinov, and it's all about that diamond. I can't wait to download it and watch it when I get home. I have a website I use to watch all the more current as well as classic movies - Movieberry. We learn about the Nubian eunuchs who served in the harem. Now that I've been to Egypt, I know that the Nubians were the blacks who lived in southern Egypt and Sudan. Some were sold as slaves to the sultans. The sultans had many of them castrated and gave them important jobs in the harem. They were in no danger of impregnating the women in the harem. I learn that most of the women in the harem had no contact with the sultan, sexual or otherwise, and that many of them married other civil servants working in the palace. The palace is beautiful, huge and overwhelming for someone like me, who has no background in Byzantine or Ottoman history. Finally, after a rich but bewilderingly complex four-hour palace visit, our feet are longing for a rest. We walk over to the Sultanahmet Koftecisi, an old, famous kofta restaurant right in the middle of the old city. After hours at the palace, it is a relief to sit down and eat a couple of meatballs, even if we have to climb up three flights of stairs to get a seat. The restaurant is overrun with tourists and Turks, and we taste why. The food is tasty and economically priced. Harun says I can eat the salad. A welcome change from Egypt, where the salads made me sick. By now the weather has changed, and our bus sloshes through rain as we are driven to a museum that was once a church - the Chora Church. This is in an old, somewhat run-down part of the city, where we see more traditional architecture. The houses are made of wood! The wooden structures remind me old-fashioned American homes. I could almost see a house like these in an old part of Minneapolis or Queens, New York. 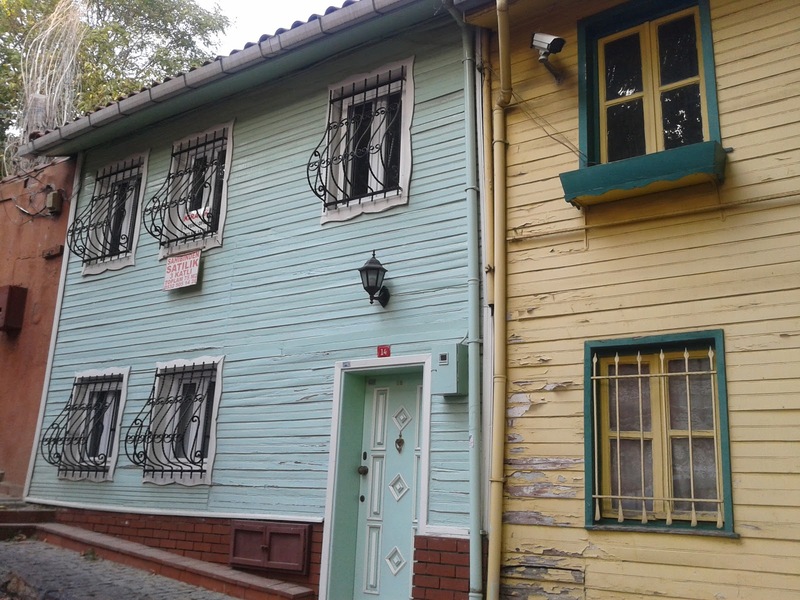 many of these houses have since burnt down in some of the many fires that have ravaged Istanbul. This church is supposed to have excellent examples of early Byzantine mosaics. I can't take it in, and I'm not even allowed to take any pictures. I am cold from the rain, and exhausted from our long tour of the palace. Finally, we are finished touring for the day. Our bus drives back to Beyoglu, the section of Istanbul we're staying in. Even though it's rush hour, there are no huge traffic jams like in Cairo. We drive along streets the Nobel literature prize winner Orhan Pamuk wrote about in his book, Istanbul. He comes from this section of Istanbul - and logically for us, it's the most European part of the city. It feels really comfortable, almost like any other European city. In the evening, Peter and I ride for the first time in the historic tram that takes us along a huge pedestrian shopping street over two miles long, called Istiklal Caddesi. It starts out at Taksim Square and goes all the way to the Galata Tower. We get ripped off by the ticket seller at a kiosk. We wanted a round-trip ticket, but he sells us one-way tickets for the price of a round trip. No matter, we will walk back from our restaurant anyway. This is a wonderful area of the city to explore. I want to come back and see more. It has all the usual European and American chain stores and restaurants like Burger King and MAC cosmetics, cafes, pubs and discos. There are even English book stores here. And it's loaded with Turkish young people out for the evening - thousands of them! They seem to have plenty of time and money. They are dressed just like young people in Germany or New York. Istanbul seems to be a really hip place, with disco music blaring from the clubs along the avenue. If I were young, I'd fly out here for a long weekend in October and enjoy warm days at the beach and balmy weather in the evening, strolling along the Istiklal Cadessi with my boyfriend - or girlfriend, hoping to meet someone at one of the clubs, or shopping. The shops seem to be open until late into the evening. But Peter and I are too old for clubbing and too tired to shop. We enjoy each other, holding hands as we meander back to the hotel. Old Istanbul is exotic. Modern Istanbul is - well, western and well-to-do. We still hear the muezzin calling for prayer in the mosques, but the people look so secular, I wonder how important their religion is to them. I'm torn between relief at finding a comfortable, western city with mosqes and disappointment that this city is not more exotic.